Our line of Pirate attire is designed and made from authentic looking materials, we feel these are some of the best period clothing available. These are not cheap costume pieces but real durable clothing as historically accurate as possible. We know our customers demand the best from us and with our new line of historic clothing we hope we have succeeded once again. This bicorn is modeled after the hats worn by military and naval officials in the late 18th century. Made of pressed EVA, covered in black ultra suede, and complete with ornate detailing. Made from 100% cotton fabric, this Admiral's coat has been designed to ensure authority and command. Premium metal buttons and lace-work separate the Admiral from his crew. Our Alvilda Striped Skirt, in 100% Cotton, features the striped design and zig-zag hem so often seen in pirates of the silver screen. Elastic at the waist for comfortable wearing and layering. This simple rayon dress features side lacing for a flattering, adjustable fit. Looks great on any figure. Light brown chemise sold separately. Made from a poly/rayon blend, this vest is an essential addition to the Admiral's wardrobe. With premium metal buttons, functional side pockets, and lace-work, it exudes class and authority. Full satin lining. This vest is perfect for Pirate, Gothic, or Steampunk ensembles. Black cotton velvet makes up the body, which has been decorated in a Napoleonic style with gold and black trim. 18 antique brass buttons complete the look. Strap in the back for adjustability, polyester lining. Our Barbarossa Blouse is made from rayon crepe fabric. It has a plunging V-shape neckline with frills around the neck and down the front. Loose-fit sleeves have a frill at wrist. Our Ashaki Skirt is made from rayon fabric. It has 2 overlapping, juxtaposed layers. Elastic and drawstring at waist for easy wearing. Our Arabella Cotton Dress features rich brocades and beautiful trim. Lacing in the back ensures a flattering fit. Our Anne Bonny striped blouse is made of 100% cotton. The puffed sleeves can be worn on or off the shoulder, with the help of a drawstring at the neckline. (Relaxed) 25" 26" 28" 30"
(Stretched) 43" 47" 51" 55"
Sleeves 27" 27" 27" 27"
Length 30" 31" 31" 32"
Our Bellamy Belt is the perfect choice for almost any Pirate outfit. The heavy grade 1.5 inch wide leather belt is gorgeously accented with pewter skulls and a heavy duty Skull with Crossbones buckle. Our Angmar Medieval Overdress is made from soft cotton fabric. This blue over dress has an open front with lacing at the torso for a fitted look. Designed to worn with any of our historic chemises, sold separately. Buccaneer Captain’s Woolen Coat in Blue or Grey. The bitter cold of the English Channel will be no match for this dashing captain's style coat. This heavy woolen coat is one of the best we have ever produced. The long period cut, large bell cuffs, and antiqued buttons make this coat one stunning piece of pirate garb. Our Buccaneer Pirate Shirt is a rayon viscose shirt with a single frill on the chest. Loose-fit sleeves with vertical and horizontal elastics. A small frill at the wrist. Our Bully Hays Pirate Shirt is a relaxed shirt with eyelets and drawstring on sleeves and down the front for adjustability. Our Buccaneer Pants are modeled after one of the most famous styles from when pirates ruled the oceans. Made from 100% cotton, these pants have long fitted cuffs which start just below the knee. Our Blackbeard coat gives a ships' Captain an air of distinction. The cotton velvet fabric, gold buttons, and black lace make this a must have for any Captain leaving on a voyage. Our Buccaneer Pirate Shirt Plus Size is a rayon viscose shirt with a single frill on the chest. Loose-fit sleeves with vertical and horizontal elastics. A small frill at the wrist. This linen vest features wooden buttons, back lacing for a flattering fit, and a functional side pocket. With it's rustic look and long, clean lines, this vest looks equally at home at pirate festivals or summer gatherings. Blackbeard's Pirate Coat, one of the coolest pirate jackets we offer. Blackbeard’s Coat is from a black cotton brocade. Open design, leather-covered buttons along front and cuffs. Two full pockets and a black satin lining. This suave, fitted Buccaneer Coat is made from a wool blend fabric. It includes decorative metal buttons along both front sides. The large cuffs make this coat the perfect pirate piece. Satin lining for comfortable wear. The color of this coat makes this Burgundy Velvet Pirate's Coat a brilliant pirate outfit piece. It is made from 100% cotton velvet, lined with satin. The metal buttons give it an authentic feel. It also features functional pockets to carry your compass and tools. Shown with the matching vest, sold separately. Dashing and daring describe this Blue Velvet Pirate Vest, which is made in a brilliant blue cotton velvet with a satin lining. It nips in at the waist, then flares to mid-thigh. It features metal buttons all the way down the front, accented with white decorative lace. This Blue Velvet Pirate Coat, with flowing 100% cotton velvet fabric and satin lining, features decorative lace down the front. Functional pockets at either side provide room for all of your essentials. Decorative metal buttons add style, and box pleats at the back provide a comfortable fit. Shown with matching vest, sold separately. This Plus Size Blue Velvet Pirate Coat, with flowing 100% cotton velvet fabric and satin lining, features decorative lace down the front. Functional pockets at either side provide room for all of your essentials. Decorative metal buttons add style, and box pleats at the back provide a comfortable fit. Shown with matching vest, sold separately. This vest is perfect for Pirate, Gothic, or Steampunk ensembles. Black cotton canvas makes up the body of the vest. Our Captain Charles Vane Pirate Shirt is made from thick and rich Viscose fabric. The double ruffle in front and on the sleeves adds to the grace of the shirt. The drop shoulders of this shirt give it the perfect Renaissance look. Our Campbell Renaissance Shirt is made from satin. This beautiful, loose fitting satin shirt made to be worn on special occasions. Satin frills in front and on sleeves. This version of the Captain Charles Vane Pirate Shirt is made from cotton. The Double ruffle in front and on the sleeves adds to the grace of the shirt. The Drop shoulders of this Pirate shirt give it the perfect Renaissance look. Our Cap'n Quincy Shirt is made from rayon fabric. It has a special sleeve design- with the sleeves resting on the wrist and creating a fluffy look near the cuff. These are button Sleeves. Our Captain Clegg Striped Pants are made from 100 % cotton. Zig-zag hem and striped design for the classic pirate look. Elastic at the waist for easy wear. Made from cotton velvet, with black lace on the front and cuff. Golden buttons embellish the torso as well as the collar, pockets, cuffs. Our Captain Benjamin vest is made from wine-colored cotton velvet with functional golden buttons. This black pirate coat is made from cotton velvet, with functional buttons. The pockets and cuffs have been decorated with buttons to add to the grace of the coat. Our Captain De Lisle vest is made in black cotton velvet, and has functional gold buttons. Our Captain Easton Coat is a stately coat made from cotton velvet, featuring golden lace and golden buttons. Both pockets are functional, decorated with buttons. The workmanship is supreme and will withstand any number of voyages. Our Captain Easton vest is made from cotton velvet. It is detailed with golden lace and buttons. Our Plus Size Cap'n Quincy Shirt is made from rayon fabric. It has a special sleeve design- with the sleeves resting on the wrist and creating a fluffy look near the cuff. These are button Sleeves. Our Captain Easton vest Plus Size is made from cotton velvet. It is detailed with golden lace and buttons. Finely crafted to withstand many voyages. Our Captain Charles Vane Pirate Shirt Plus Size is made from thick and rich Viscose fabric. The double ruffle in front and on the sleeves adds to the grace of the shirt. The drop shoulders of this shirt give it the perfect Renaissance look. Our Campbell Renaissance Shirt Plus Size is made from satin. This beautiful, loose fitting satin shirt made to be worn on special occasions. Satin frills in front and on sleeves. Our Captain Easton Coat Plus Size is a stately coat made from cotton velvet, featuring golden lace and golden buttons. Both pockets are functional, decorated with buttons. The workmanship is supreme and will withstand any number of voyages. Our Captain De Lisle Vest Plus Size is made in black cotton velvet, and has functional gold buttons. Our Captain Benjamin Vest Plus Size is made from wine-colored cotton velvet with functional golden buttons. This Calico Jack Coat is made from 100% cotton velvet fabric and includes a soft satin lining. For elements of style, it has large bell cuffs and metal buttons. It also has functional pockets at either side. Every pirate needs a vest that fits well and looks great. 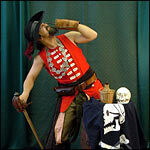 This Captain Bridge Pirate Vest has a 100% cotton velvet outer shell and satin lining. The satin lining helps it follow the body with ease. It features a number of metal buttons, as is characteristic of the very best pirate vests. Every pirate needs a vest that fits well and looks great. This Captain Bridge Pirate Vest - Plus Size has a 100% cotton velvet outer shell and satin lining. The satin lining helps it follow the body with ease. It features a number of metal buttons, as is characteristic of the very best pirate vests. This Captain Bridge Pirate Coat has a 100% cotton velvet outer shell and satin lining. The satin lining helps it follow the body with ease. This mid-length coat features a number of metal buttons. Shown with matching vest, sold separately. This Captain Bridge Pirate Coat - Plus Size has a 100% cotton velvet outer shell and satin lining. The satin lining helps it follow the body with ease. This mid-length coat features a number of metal buttons. Shown with matching vest, sold separately. The Burgundy Velvet Pirate's Vest looks great on it's own- or pair it with the matching coat. This 100% cotton velvet vest is soft and luxurious, and made to fit like a glove. The satin lining helps it retain its shape, and the metal buttons from the top to the bottom add an element of style to this vest. The Burgundy Velvet Pirate's Vest - Plus Size looks great on it's own- or pair it with the matching coat. This 100% cotton velvet vest is soft and luxurious, and made to fit like a glove. The satin lining helps it retain its shape, and the metal buttons from the top to the bottom add an element of style to this vest. The color of this coat makes this Burgundy Velvet Pirate's Coat - Plus Size a brilliant pirate outfit piece. It is made from 100% cotton velvet, lined with satin. The metal buttons give it an authentic feel. It also features functional pockets to carry your compass and tools. Shown with the matching vest, sold separately. Our canvas pirate bandanna is perfect for topping off a pirate or gypsy costume, or just keeping your hair out of your face on a hot day. Made from sturdy cotton canvas. Our David Herriot Pirate Shirt is made from thick and rich Viscose fabric. The sleeve has a drawstring closure. Eyelets with drawstring have been provided in front for easy wearing. This historic shirt has a Pirate and Renaissance look. Our Colonial Shirt is made from rayon with lace frills on the wrists and chest. Our Early Renaissance Shirt is made from durable and comfortable rayon. It features an open, ruffled neckline and drop shoulders. The wrists are elasticized. Our Classic Blouse is made in a linen blend, a textured yet breathable fabric. Ruffled bell sleeves infuse medieval spirit; but the frill on the neck line, chest, and hem make it very different from the standard peasant blouse. Our Crop Top blouse is made from fine quality cotton crepe. Designed to be worn on or off the shoulder, wear it under a bodice for the perfect Faire look. Our double layer Medieval skirt, in contrasting colors, gives the option to gather up the outer skirt with drawstrings (at each side). Both skirts are sewn together at the waist, where drawstring and elastic create easy, comfortable wearing. Our Captain England coat, wine colored cotton velvet, is divine! The pockets and cuffs have been decorated with golden buttons. Our Captain La Sage coat is made from black cotton velvet. Silver lace down the front and on the cuffs adds glamor to this seaworthy look. Grey buttons with an anchor design highlight the collar, pockets, and cuffs. Our Captain La Sage vest, in black cotton velvet, has been decorated with silver lace and grey anchor buttons. Golden lace and buttons adorn black cotton velvet in this stately vest. Made to match the Captain Peter Coat. This Captain Peter Coat is a golden lace and functional golden buttons grace this black cotton velvet coat. The flap pockets are not just for show- you can stow your plunder in them. Our Child's Cotton Sash is one of the best accessories for kids of all ages!! Wrap it around your head, your waist, or tie to your arm to hold slashed sleeves out of the way. Our Cotton Medieval Sash is one of the most versatile accessories you'll ever own! Wrap it around your head, your waist, or tie to your arm to hold slashed sleeves out of the way. Look closely, each ruffle is edged with kingri lace, adding to the delicate nature of this beautiful Cotton Ruffle Blouse. Lacing is provided at the back for a truly feminine fit. As a privateer, Captain Henry Morgan battled through jungles and in major sea battles for the spoils of war. This coat is an homage to a pirate known as a real man’s man. Crafted in a beautiful blood red cotton velvet with matching red cotton lining. Our Early Renaissance Shirt Plus Size is made from durable and comfortable rayon. It features an open, ruffled neckline and drop shoulders. The wrists are elasticized. Our Plus Size Captain La Sage coat is made from black cotton velvet. Silver lace down the front and on the cuffs adds glamor to this seaworthy look. Grey buttons with an anchor design highlight the collar, pockets, and cuffs. Our Captain Peter Coat Plus Size is a golden lace and functional golden buttons grace this Plus Size black cotton velvet Captain coat. The flap pockets are not just for show- you can stow your plunder in them. Our David Herriot Pirate Shirt Plus Size is made from thick and rich Viscose fabric. The sleeve has a drawstring closure. Eyelets with drawstring have been provided in front for easy wearing. This historic shirt has a Pirate and Renaissance look. This heavy black felt hat is perfect for the Don Juan ensemble. Features distressed edging, a braided suede band and silver details. One size fits most. Made from 100% cotton fabric and designed for a Commodore- a person of power, authority, and responsibility. Premium metal buttons and intrinsic lace-work is a constant reminder of the superiority of the wearer. Our Commodore’s Waistcoat is fit for Pirate wear or the British Navy! The waistcoat is lightweight for hotter weather, however it can be worn under a commodore’s coat. This Captain Jan de Bouff Coat features rich brocade fabric, cotton velvet bells cuffs, as well as a velvet trim down the front. Metal buttons at the cuff and a satin lining give it an elegant look. This Captain's Coat is made from soft cotton velvet fabric, with decorative lace along the edges. It features functional pockets, large bell cuffs, and is satin lined. This Don Juan waist sash has a layered-look with two long, diagonal tails. Buttons allow for a variety of waist sizes. Poly-cotton blend. S/M (28"-34") or L/XL (34"-41"). Wear with the Don Juan Shirt (101580), Don Juan Pants (101581), Don Juan Vest (101584), Don Juan Mask (101582). The Don Juan Vest offers the perfect touch to finish off your well-dressed nobleman look. The sleeveless vest is made of rich black cotton velvet and features heavy black brocade trim in wavy lines down the front. The Renaissance vest fastens in the front with a string closure. Ahoy all pirates we have a new Diagonal Pirate Sash! Two wonderful sashes in Blood Red or Midnight Black. These pirate accessories come in generous lengths and are designed to wrap around your waist twice before knotting.